I never have tahini in my cupboard anyway……this version uses natural yoghurt instead. Saves on calories, doesn’t compromise on taste. Ssshh….. don’t tell the purist or traditionalists. Just try it. Have a look at the other variations below too. Freezes really well. Place the pepper, (skin side up) and garlic on a baking sheet and roast for 20-25 minutes, until skin is blackened/blistered. Remove from oven and pop straight into a freezer bag and seal. When cool enough to handle, just peel and discard the skins. 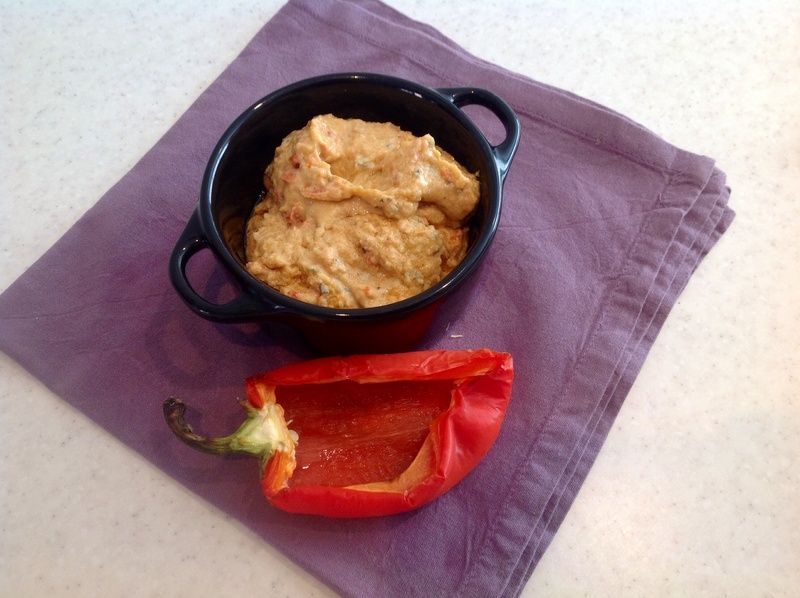 In a blender put the chickpeas, pepper, garlic, yoghurt, lemon juice, chilli and blitz to a stiff paste. Slowly add olive oil, adding a drop of water, if necessary, to egg the consistency preferred. Omit the red pepper and garlic and add 1tbs chopped fresh coriander at the end. Check the taste. Add more Lemon Juice or Coriander as preferred. Simply blitz a can of drained hickpeas, 70g sun dried tomatoes in oil (reserving some of the oil), pinch of smoked paprika and 1tbs chopped fresh basil.